What implications, if any, does evolutionary biology have for metaethics? Many believe that our evolutionary background supports a deflationary metaethics, providing a basis at least for debunking ethical realism. Some arguments for this conclusion appeal to claims about the etiology of the mental capacities we employ in ethical judgment, while others appeal to the etiology of the content of our moral beliefs. 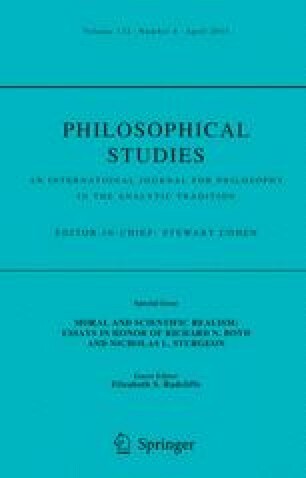 In both cases the debunkers’ claim is that the causal roles played by evolutionary factors raise deep epistemic problems for realism: if ethical truths are objective or independent of our evaluative attitudes, as realists maintain, then we lose our justification for our ethical beliefs once we become aware of the evolutionary shaping of our ethical capacities or beliefs, which would not have disposed us reliably to track independent ethical truths; realism, they claim, thus saddles us with ethical skepticism. I distinguish and spell out various evolutionary debunking arguments along these lines and argue that they all fail: the capacity etiology argument fails to raise any special or serious problem for realism, and the content etiology arguments all rely on strong explanatory claims about our moral beliefs that are simply not supported by the science unless it is supplemented by philosophical claims that just beg the question against realism from the start. While the various debunking arguments do bring out some interesting commitments of ethical realism, and even raise some good challenges as realists develop positive moral epistemologies, they fall far short of their debunking ambitions. I am grateful to Michael Bergmann, Selim Berker, Matthew Braddock, Earl Conee, Andrew Greenlee, Patrick Kain, Marc Lange, Karl Schafer, Nico Silins, Brad Weslake, and audiences at Princeton, Cornell, and the Eastern Division APA (2011), for helpful feedback on earlier drafts of this paper and related work. FitzPatrick, W. (2008). Morality and evolutionary biology. In E. N. Zalta (Ed. ), Stanford Encyclopedia of Philosophy. Retrieved, from http://plato.stanford.edu/entries/morality-biology/. Railton, P. (2010). Moral camouflage or moral monkeys? In The New York Times, The Stone, July 18. Retrieved, from http://opinionator.blogs.nytimes.com/2010/07/18/moral-camouflage-or-moral-monkeys/.